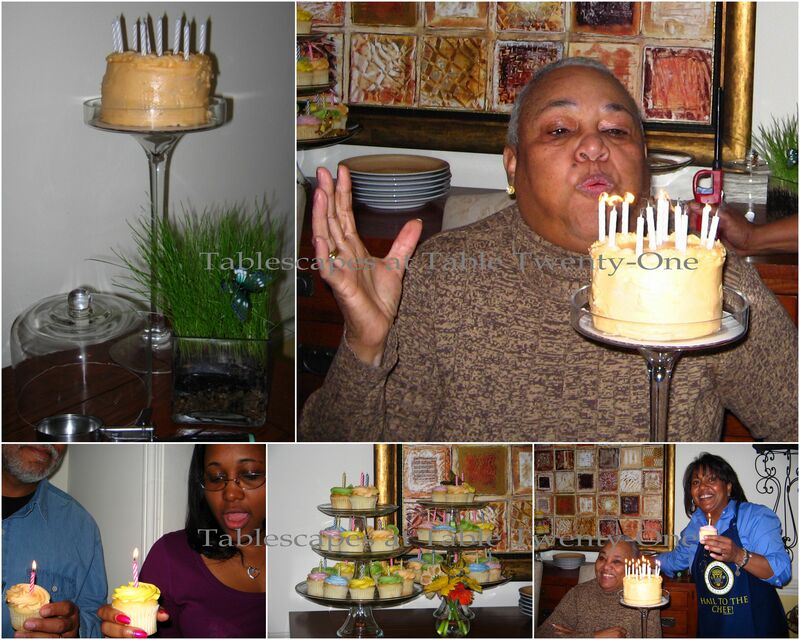 My husband and I hosted a much less formal birthday bash for my Mom in 2009 to celebrate #80. 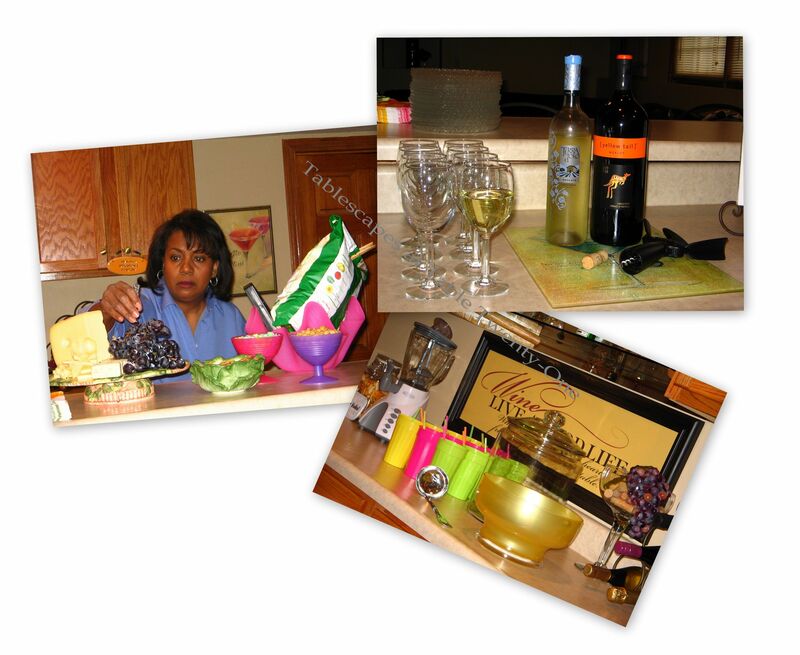 We started off with a wine and cheese bar for family & friends. 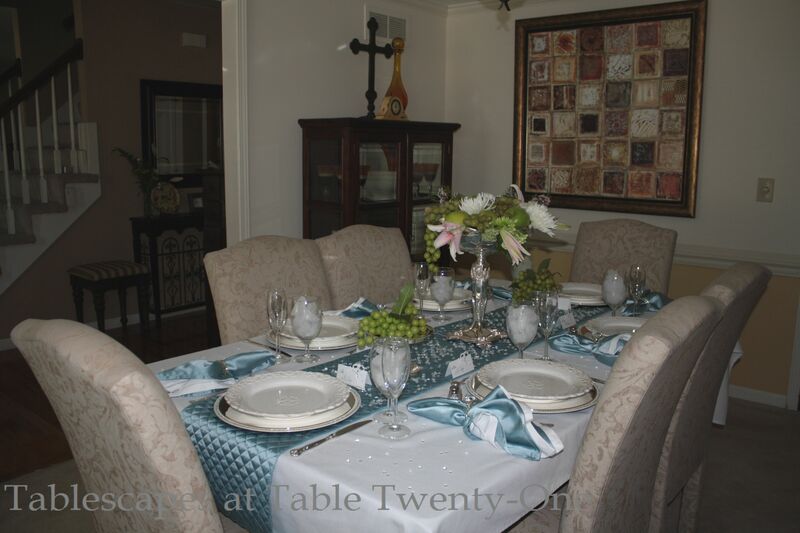 My Mom’s official birth date is March 22, so what better way to ring in the season than with a spring tablescape rich with the colors and elements we miss over the long, cold winter? Mom really got a kick out of my sudden “green thumb” with rye grass grown just for the occasion in clear glass containers. (She then tried to play it off…like, “Whatever, dude. No big deal. I could’ve done that with my eyes closed.” Look at that look on her face…and the one on mine!!! 🙂 🙂 🙂 ) Rye grass only takes a couple of weeks to look like this! See Tip #15 under the “Table Tips” tab above. Fresh Gerbera daisies add a playful and colorful element to the centerpiece set atop a length of moss. 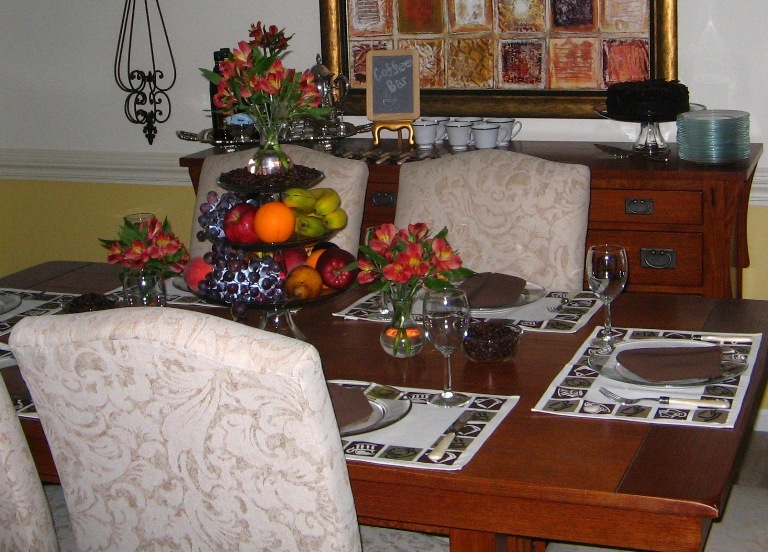 The casual dining room setting included a double layer of placemats. 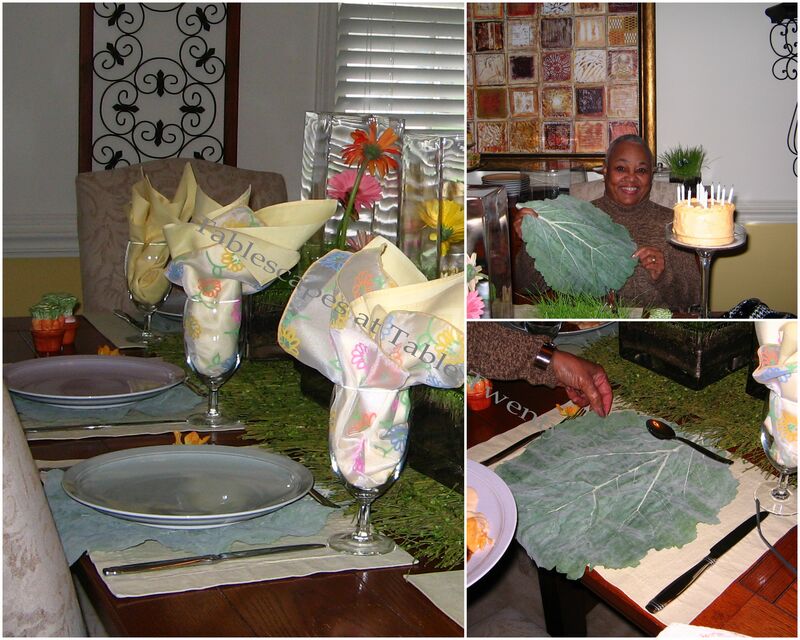 The cabbage leaf placemats were perfect for ushering in Spring! 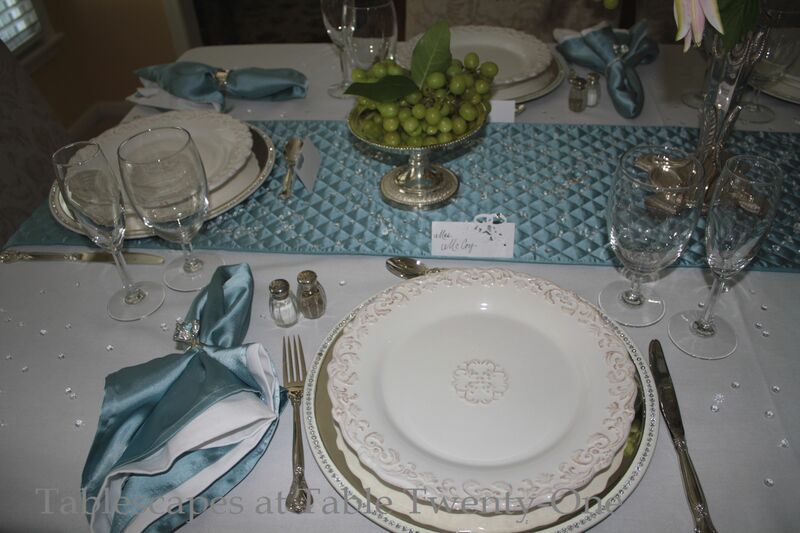 Mikasa stoneware in various Spring colors gave the table a little kick in the pants, while plain yellow linen napkins layered with gauzy floral ones danced above. Just about everybody loves a cupcake! Makes you feel like a kid again, doesn’t it? For this celebration, vanilla cupcakes frosted in spring pastels and decorated with “fluttering” butterflies were the talk of the party! 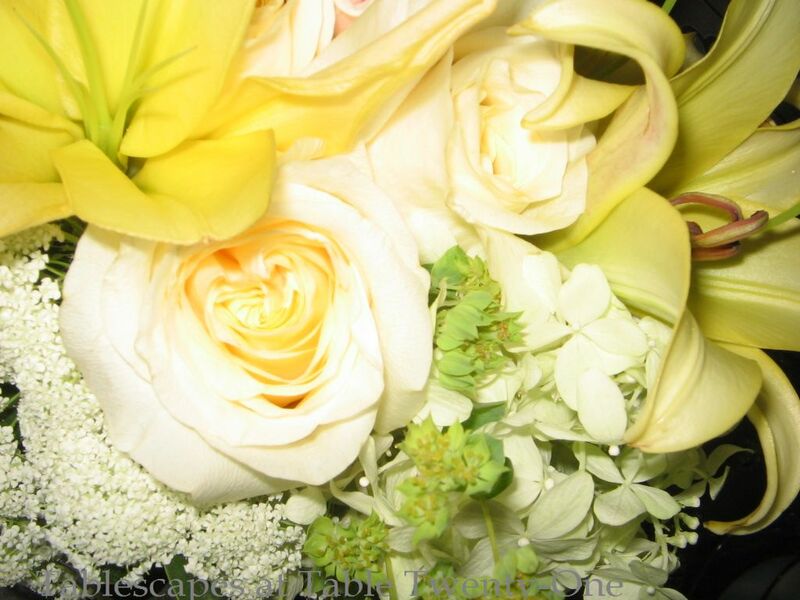 You can’t go wrong when decorating with butterflies…they enchant both young and “not-as-young”! 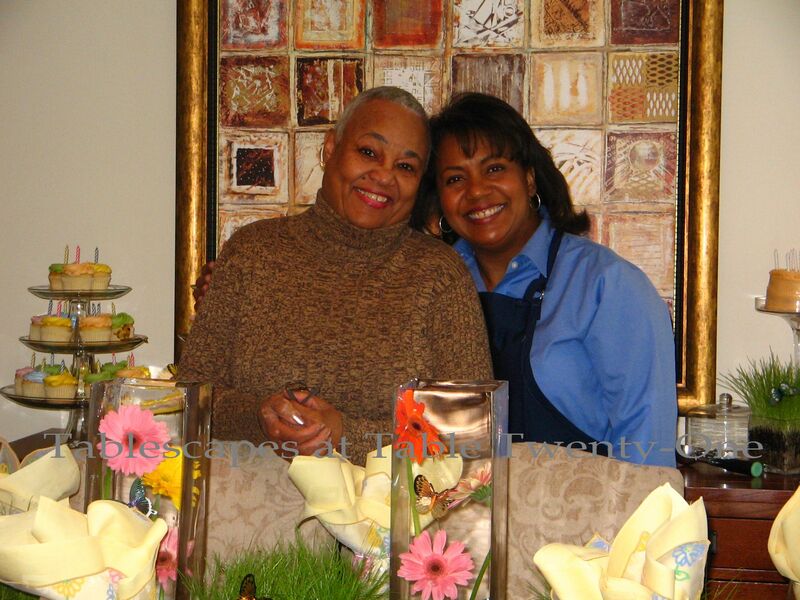 In 2009 we celebrated my stepdaughter’s birthday with an open house brunch. 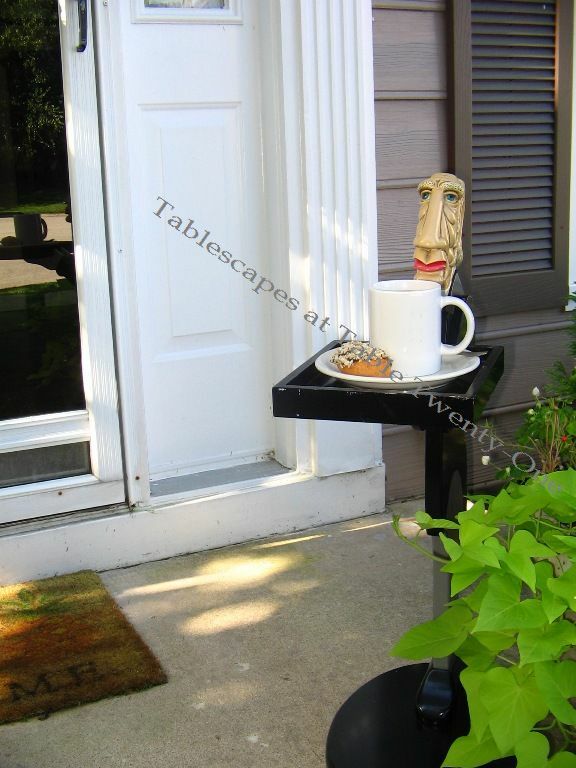 As a hint of what was to come, guests were greeted by our jolly old English butler, Geoffrey, offering coffee and a donut on the front porch. 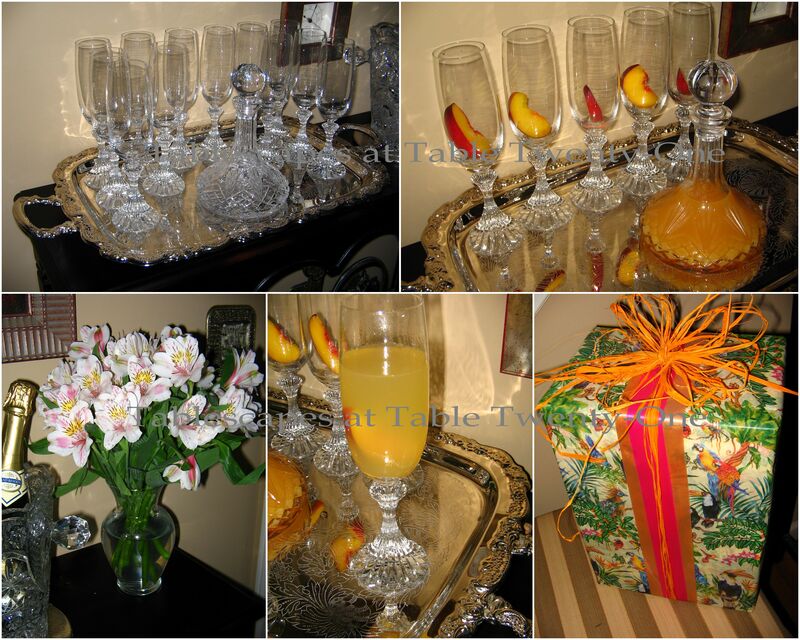 Upon entering the foyer, guests were offered peach Bellinis served in cut crystal Mikasa flutes displayed on a beautiful silver tray. 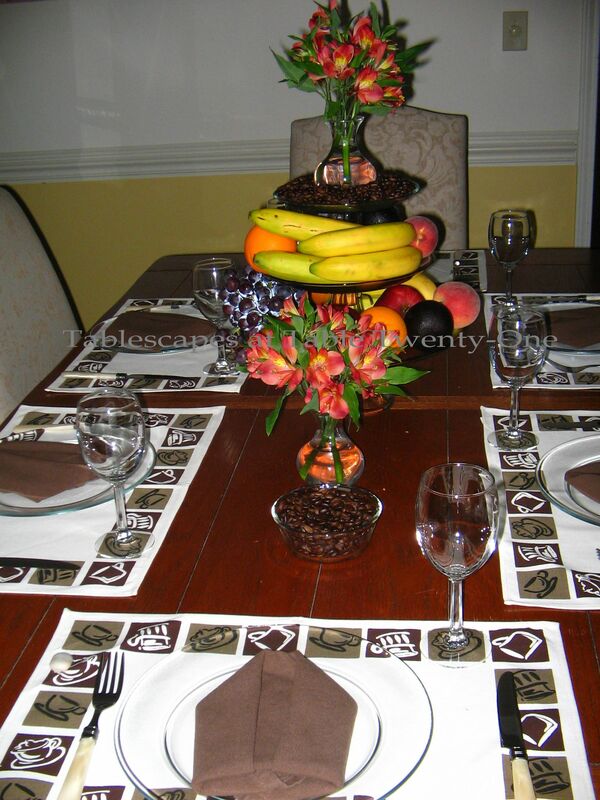 The dining room was set for six with fun coffee motif placemats from Bed Bath & Beyond. 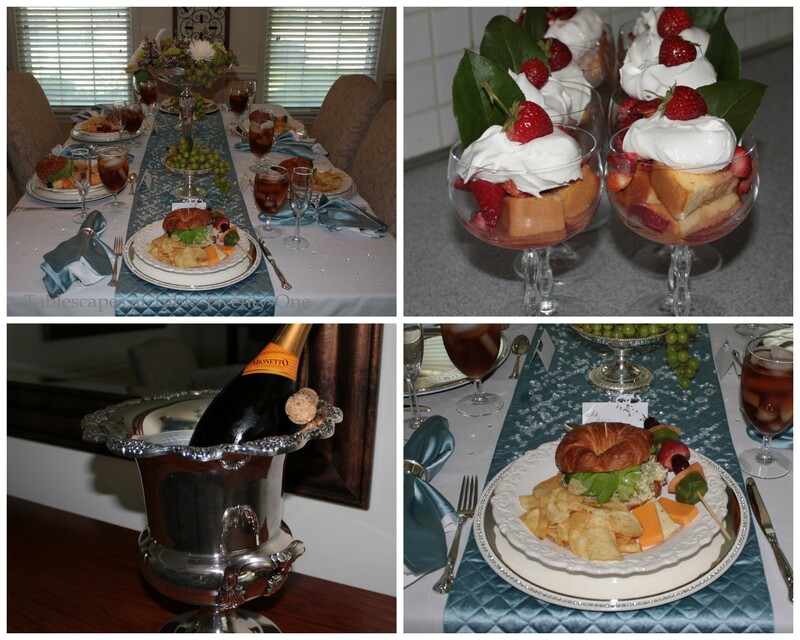 I like to use edible centerpieces on tablescapes whenever possible. 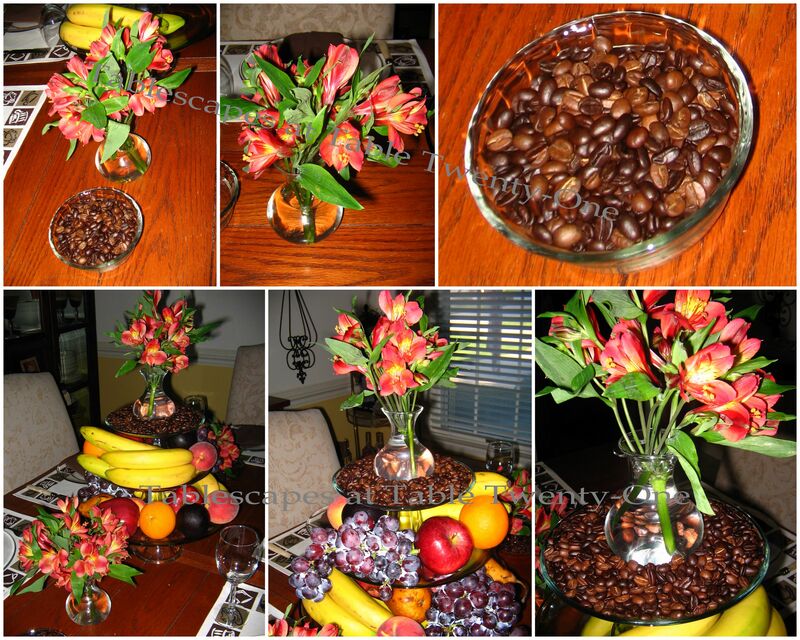 This one includes lots of fresh fruit stacked on glass cake plateaus, accented by aromatic roasted coffee beans and simple bouquets of colorful alstroemeria. 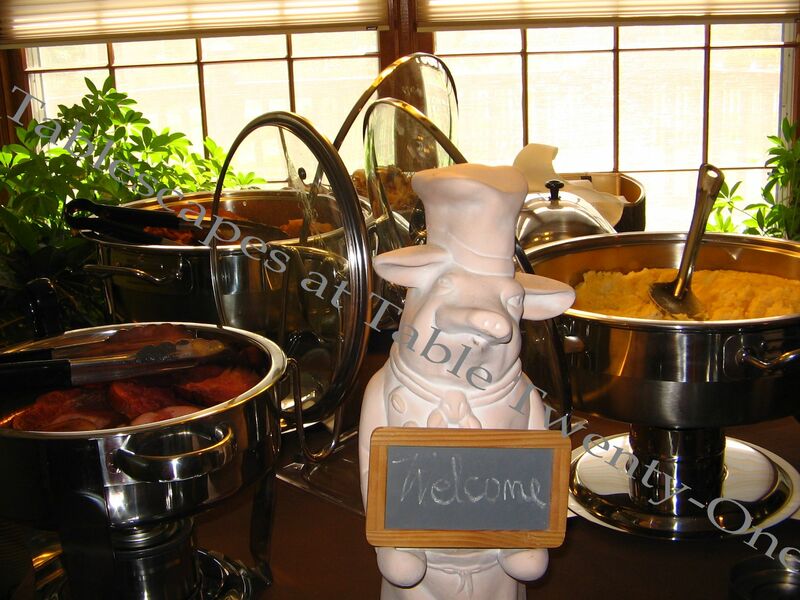 Set up on the buffet behind the table is a scrumptious coffee bar with variety sugars and liqueurs. 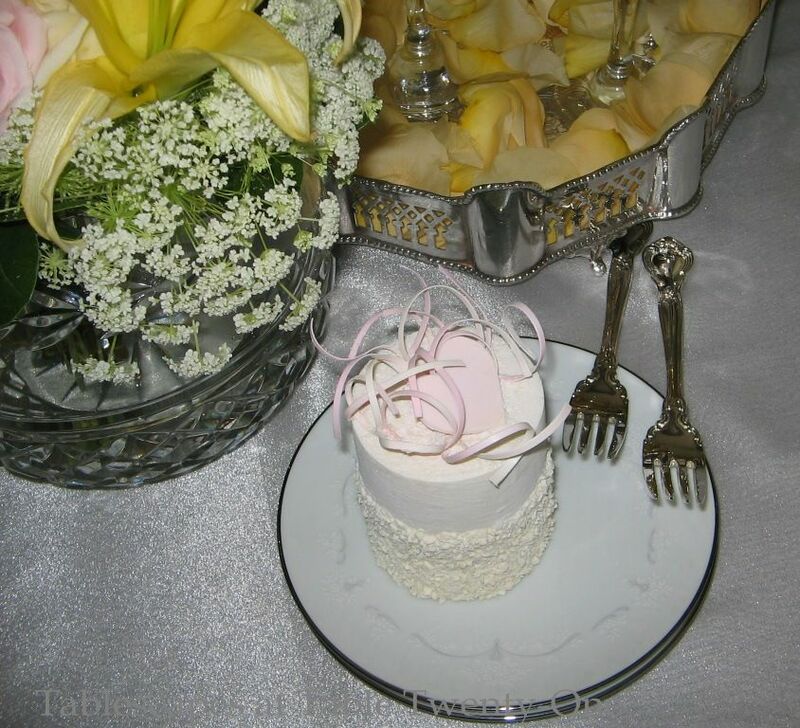 The silver Victorian sugar scuttle and rock candy sticks are fun details that help it all special. 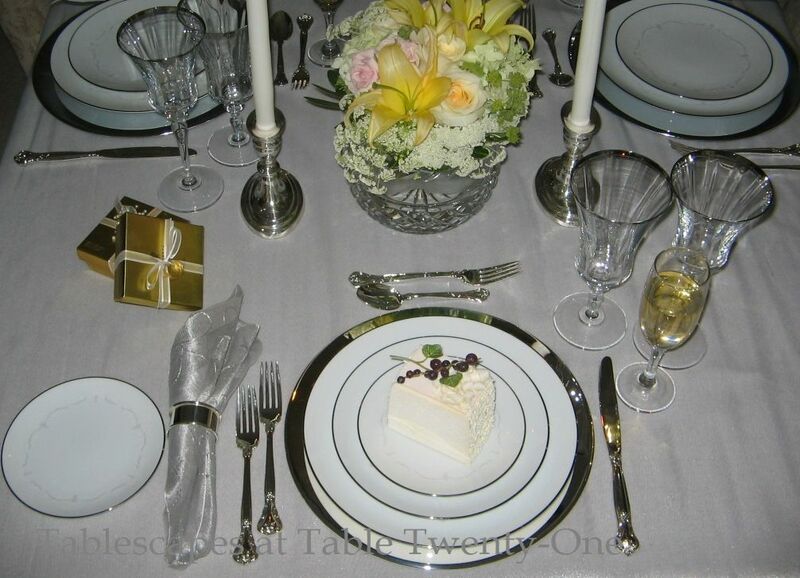 The faux mother-of-pearl handled flatware from Target is set end-to-end for visual impact. 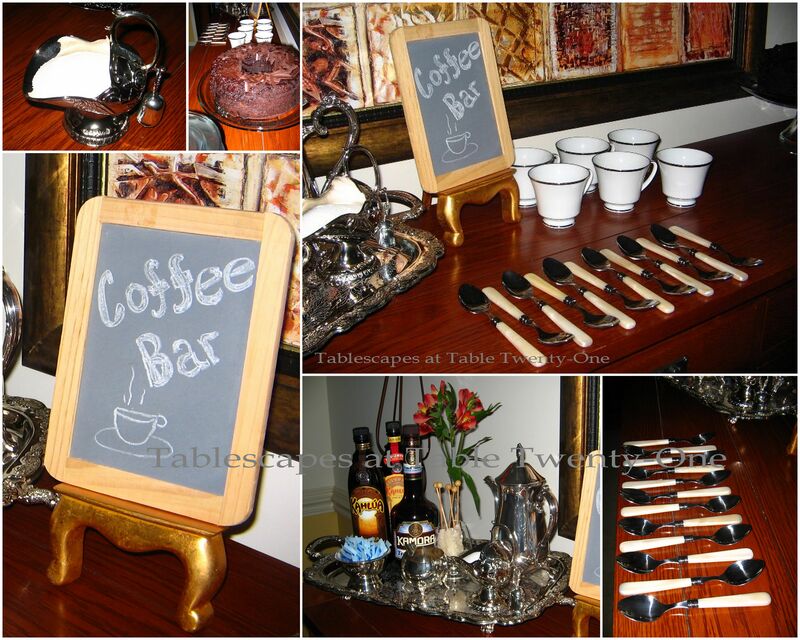 I created the fun coffee bar sign using an inexpensive miniature chalkboard from Hobby Lobby. Displaying it on the gold easel makes it look a little bit fancier despite the unfinished wood frame. 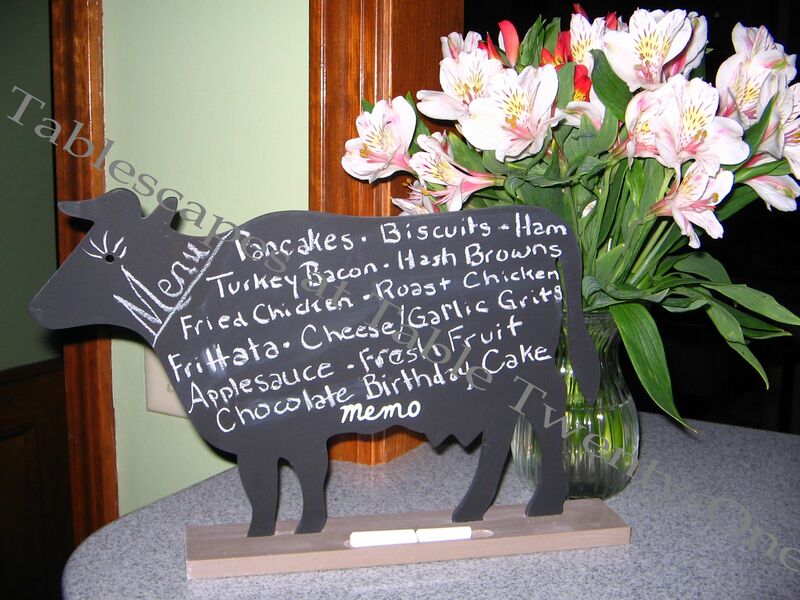 Fun touches like this chalkboard cow from J’Adore in Kansas City, MO, make the buffet service area a little more fun. 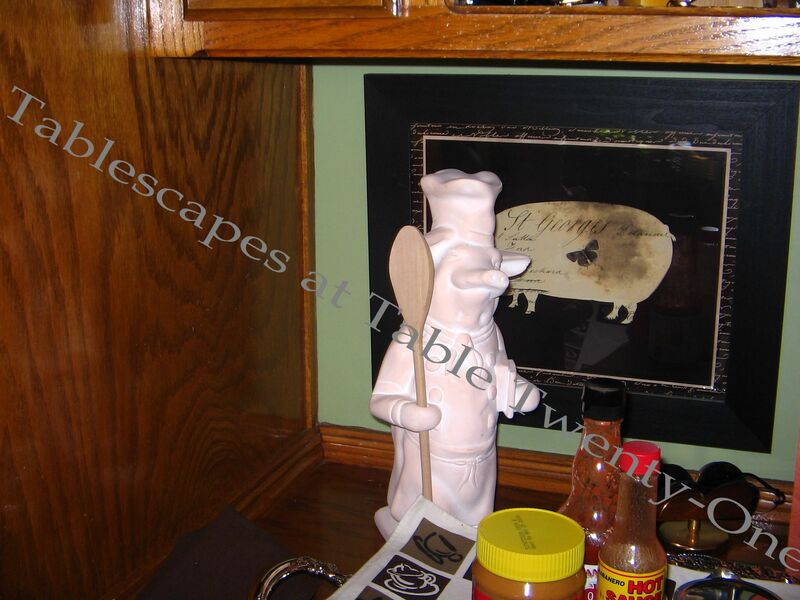 The kitchen pigs presiding over the chafers and condiments are from Stein Mart. 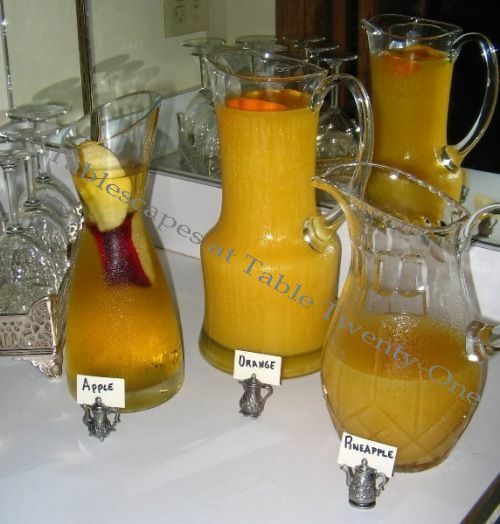 A juice bar was set up near the buffet, with each serving vessel accented with corresponding fresh fruit slices. Name tags are displayed on card holders resembling miniature coffee pots.